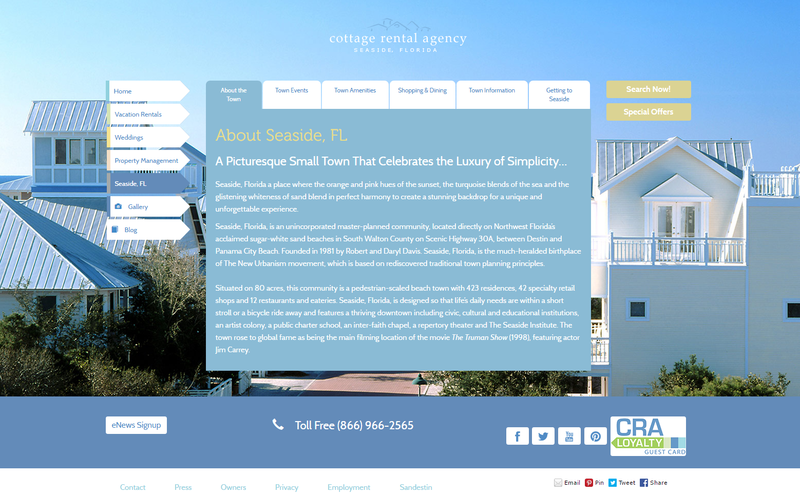 Formerly a part of the seaside Development Community, the Cottage Rental Agency offers vacation rentals for properties located at the Seaside Community in Destin, Florida. 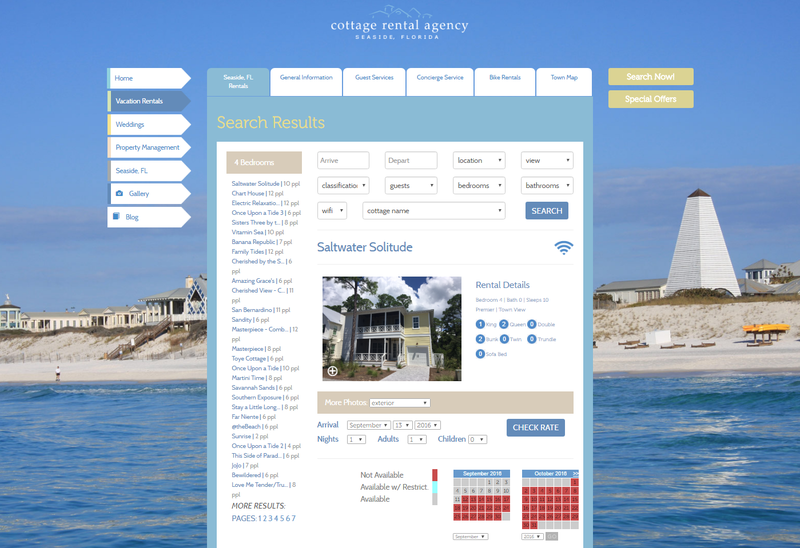 NearSource developed their current Online Booking Platform for their vacation rentals. NearSource, Inc has also been providing web design, development, maintenance and hosting services for them since 2004. 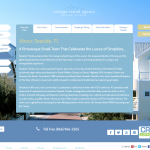 Cottage Rental Agency was using a legacy DOS based Property Management System (PMS) called First Resort. This system offered an online booking interface that was very slow and didn’t function will with concurrent users and had a long loading time to show booking rates and availability information. NearSource developed the Veristay online booking platform to overcome these issues they were having with online booking. 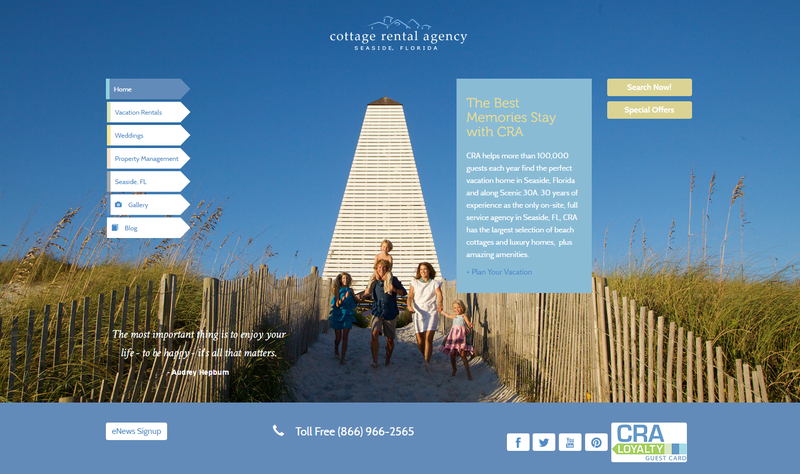 Using Veristay in conjunction with a proprietary CMS “Hypergenius”, Cottage Rental Agency was provided with the ability to setup rental property descriptions, photos and amenities and link them to properties in their PMS. They can also enable and disable each property, specify which units are lock-offs of bigger units and configure other settings. Another important feature was the ability to create an Owner Portal where property owners can log on, view their properties, rental activity and make owner reservations. The biggest benefit of the Veristay system was the actual online booking / search interface. Users are now able to search for specific units that match certain amenity requirements such as Number of Guests, Number of Rooms, Location, etc and search for units that are available in specific dates. 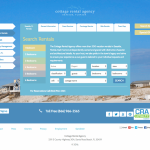 The search results show a list of matching units, and when a unit is clicked on, the user can see the property description, photos and an availability calendar that shows available booking dates. They can switch months in the calendar, and they can click on different units to compare. After the user decides on a property they can click on the “check rate” button which shows a customized version of the First Resort PMS booking page that shows the rate and allows the user to reserve the property. This was accomplished by building a Veristay Data Connector that exports unit availability information from text log files every 15 minutes to keep the available dates as current as possible. A Nightly export/import tool was also created that imports new units, updates amenities and refreshes the availability information for all units. Veristay custom PMS modules were added to the Hypergenius CMS system so they can view all online reservation requests, send up follow up emails, and manage all of their units. 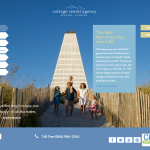 After several years of using First Resort, Cottage Rental Agency decided to change their PMS platform to Visual One PMS which offered an online booking interface and a more user friendly interface for the Rental Agents. However the online booking interface did not fit the requirements and did not allow agents to manage property amenities, descriptions and photos as well as the Veristay module created for Hypergenius. The availability calendar was too slow for their needs and the workflow from a property search to an actual booking was too different from the booking process that guests were accustomed to. 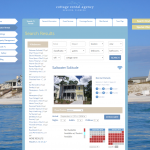 Cottage Rental Agency opted to upgrade the Veristay platform to work with Visual One. To do this a new Veristay Data Connector was created and this imports availability information every 15 minutes and a complete data refresh is done nightly. 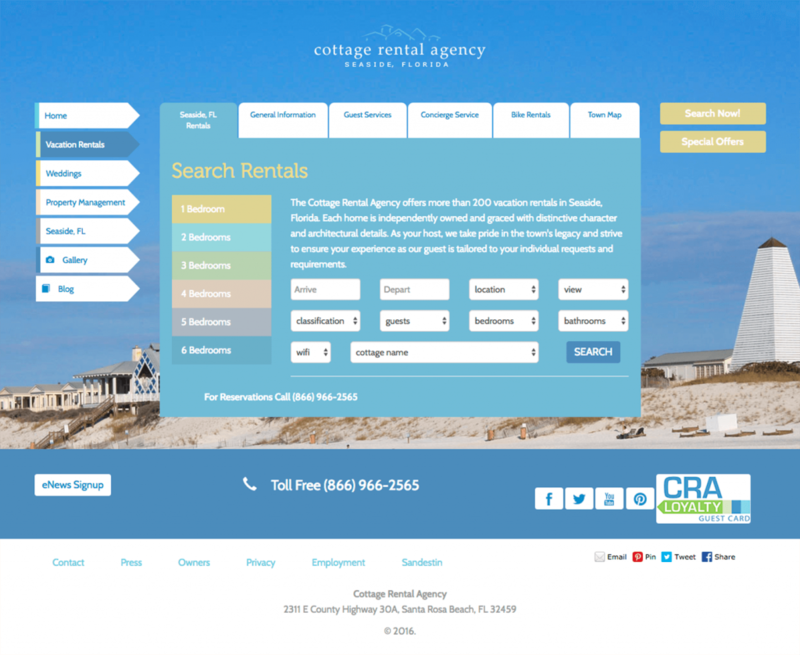 Cottage Rental Agency is still using Veristay after more than 10 years, depending on NearSource support team. NearSource also provides web development/maintenance services for them. This Veristay platform has been used by different companies such as Long And Foster and WaterColor Inn & Resort.